Almost 24 dalits have attempted to end their lives since July 11, 2016. Violent protests by Dalits have been taking place in Gujarat demanding stern action against the cow vigilante group members who publicly flogged a Dalit family and brutally beaten up seven Dalit men for allegedly skinning a dead cow in Una in Gir Somnath district of Saurashtra region on July 11, 2016. The victims' contention was that they were just skinning a dead cow and had not killed it, whereas the accused alleged these dalits were involved in cow slaughter. As many as 200 cow vigilante groups have sprung up Gujarat. They have become a law and order problem in Gujarat because of their aggression and the way they take law into their hands. With names such as Gau Raksha Samiti, Gau Raksha Ekta Samiti, they have percolated from taluka to even village level and the groups take law into their hands to deal with minorities and Dalits who run meat businesses. However, with growing anger among the Dalit communities all over India, the Una police inspector and an assistant sub-inspector (ASI) in charge of the area where the alleged incident had taken place, have been suspended. Facing flak for the incident, the Gujarat Chief Minister Anandiben Patel met the dalit victims’ family at Mota Samadhiyala village in Una tehsil of Gir-Somnath district, and promised them all possible help. The Chief Minister has ordered a CID inquiry in the matter. She also announced that a designated court will be set in consultation with the High Court for speedy trial in the matter. She has asked a Special Public Prosecutor to take up the case, adding that the investigating officer has to submit the charge sheet to the court in 60 days. National Council of Churches in India bids churches and religious institutions to condemn such atrocities against dalits. It calls upon the National Human Rights Commission to direct the State government to shut down such vigilante groups. Furthermore the state authorities are strongly urged to cultivate a culture of justice and love for all in the country, ensuring that dalits, tribals/adivasis, indeed all marginalized sections of society are given due respect and rightful opportunities for their life and livelihood. 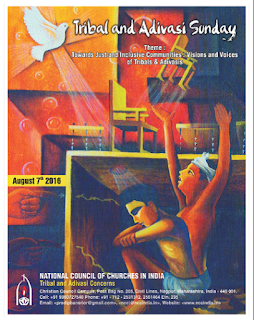 Warm greetings from National Council of Churches in India! Over the years Tribal and Adivasi Sunday has been celebrated in many parts of our country invsensitizing the local congregation on Tribal and Adivasi Concerns. Thanks to the enormous support we have received from across the churches, dioceses, parishes and institutions in celebrating this special Sunday. This year also we are inviting you to celebrate Tribal and Adivasi Sunday on 7 th August 2016 in your churches/local parishes/institutions. We are sending you hard copies of posters and a special order of worship for the day. You may please take the freedom to use the entire worship order and translate it in your vernacular language or adapt parts of it. We sincerely hope that the observance of this special NCCI Tribal and Adivasi Sunday will be an enriching one in our faith affirmation and commitment and for widening the horizon of our ecumenical journey. Let us join to celebrate Tribal and Adivasi Sunday on 7 th August 2016. 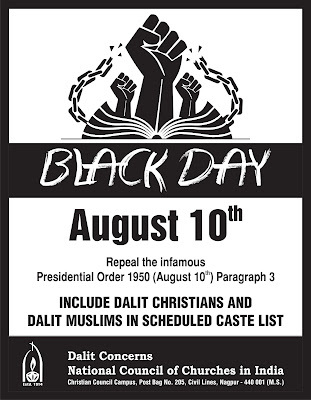 Like every year, National Council of Churches in India encourages the member Churches and organisations to proactively participate in observing the ‘Black Day’ on 10th August to raise our protest to the continual negligence of the government to the cry for the rights of Dalit Christians in the country. The infamous Presidential (Scheduled Caste) Order 1950 was signed on 10th August 1950 by the then President of India which says “No person who professes a religion other than Hinduism shall be deemed to be a member of the scheduled caste” which was later amended to include Sikhs (1956) and Buddhists (1990) in the Scheduled Caste net. But this law, as we are all aware of, keeps the Dalit Muslims and Dalit Christians from the fold of Scheduled Caste list. National Council of Churches in India requests you to kindly observe the ‘Black Day’ by organising protest meeting/ rallies/ demonstrations/ hunger fasts/ submitting memoranda/ candle vigils/ special prayers and other appropriate programmes in your church/institution to express our solidarity with the suffering Christians of Scheduled caste origin. The member Churches and organisations of NCCI are also requested to wear black badges on 10th August 2016 and place the posters, which are sent along with this letter in your notice boards. We would appreciate if you send couple of photos and a brief report of the observance to the undersigned. 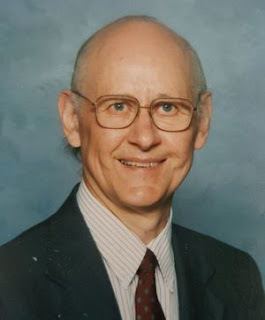 Dr. Hunter P. Mabry, 82, of Roanoke passed away on Saturday, July 9, 2016 after a long struggle with chronic radiation damage to his intestinal tract many years ago. Born in Timber Ridge in Rockbridge County, he was a native of the Shenandoah Valley. During his youth he lived in the Waynesboro area and graduated with the Wilson Memorial High School class of 1951. Later, he completed his B.Sc. in Rural Sociology at the then Virginia Polytechnical Institute (Virginia Tech), his B.Div. at the Candler School of Theology (Emory University) and served as a missionary to the Philippines, 1959 to 1963 under the Board of Missions of The United Methodist Church. A two-day workshop for Care Givers of People with Disability was held at the Elwin Centre, CSI Deaf School Campus, Sachiyapuram, Sivakasi District in Tamilnadu on 16th and 17th April 2016. 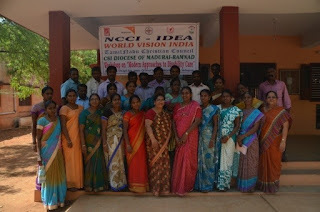 World Vision India, Indian Disability Ecumenical Accompaniment (IDEA), standing forum of National Council of Churches in India, Engage Disability, Tamilnadu Christian Council and CSI Diocese of Madurai and Ramnad, jointly organised this workshop. This workshop module was designed to help the Caregivers and Church Leaders not only to cope with the challenges posed while handling a PWD but also to bring awareness about the modern approaches to disability care. There were 50 participants representing over 20 care giving organizations from 5 districts, including caregivers from 18 Care-Giving Institutions, Parents and Relatives of PWD accompanied by church leaders. The Rev. Jeyasing, Director, Dalit and Social Concerns of the DMR inaugurated this workshop. Rev. M Dayalan Barnabas, Director, ELWYN Centre introduced the workshop, Prof. C Jebasinthai, Correspondent of CSI School for the Mentally Retarded, Satchiyapuram welcomed and Dr. Esther Kathiroli, Secretary of TNCC, greeted and Mr. Allan Benjamin, World Vision, Chennai and Mrs. Avitha Daniel, Jesus Enables Ministries, Chennai, served as the resource persons. Mr. Augustine Ponraj, Co-ordinator Dalit and Social Concerns, CSI DMR proposed the vote of thanks.